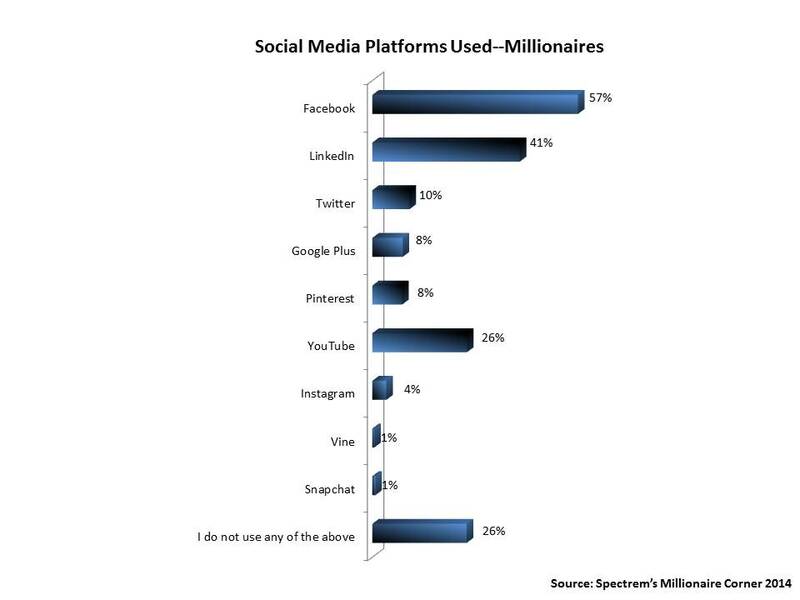 Millionaires are no strangers to social media, and usage for social purposes continues to grow, but they are still loathe to use the various platforms for financial purposes, according to a new wealth level study conducted by Spectrem Group. Facebook usage among Millionaires has more than doubled since 2010 (57 percent in 2014 vs. 26 percent in 2010), the Millionaire Corner report, “Using Social Media and Mobile Technology in Financial Decisions,” finds. LinkedIn usage, too, continues to grow apace. Four-in-ten Millionaires use the professional networking site compared with 17 percent in 2010. While comparatively few Millionaires are tweeting, usage of this social media site, too, has doubled in the last four years (from 5 percent to 10 percent). But with the exception of LinkedIn, usage of the various social platforms by Millionaires tends to be social rather than professional. A scant 1 percent of respondents have used Facebook, for example, to communicate with their financial advisor, compared with 11 percent who have reached out to their advisor via text message. The latter is not at all the favored form of communication with their advisor. Nearly nine-in-ten (88 percent) said they would not like to communicate via text. Neither are social media platforms presently the preferred vehicles to read financial blogs. On a sliding scale in which 0 equals “not very likely” and 100 equals “very likely,” even LinkedIn ranked a mere 21, while a financial advisor’s website scored 52.06 and financial media websites such as CNBC and Forbes ranked 50.81 and other financial websites a reading of 50.02.